A person suffering from hair loss, over a period of time becomes so anxious and nervous that he starts believing on each and every person who seems to give some solution about the hair loss. This does more harm than the good to the patient. He easily falls prey to the wrong information or the myths shared by the other individuals. 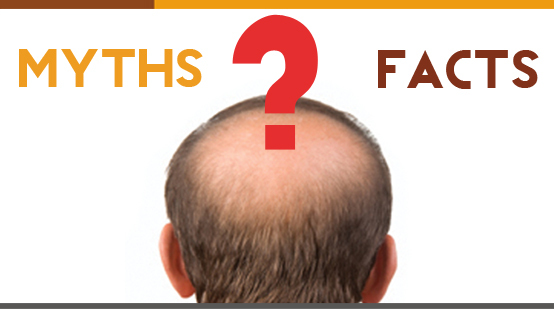 In this blog we will discuss the myths as well as the facts regarding the hair loss. Changing the shampoos frequently will result in hair loss: There is no truth in this. If you stick to only one brand of shampoo or change the brand frequently has hardly any effect on hair fall, unless you chose to have some shampoo with harsh chemicals. Washing the hair daily with cold water will stop the hair fall: This is not true. Washing the hair with cold water has no effect on growth of the hair. In fact daily washing of hair may make the hair dry and dry hair can fall off more easily. Children never suffer from hair loss: Children do experience hair fall like adults. If the children are in habit of tying the hair very tightly or if they are suffering from any scalp infection then they are likely to suffer from the hair loss. Only males can undergo hair loss. Females are not affected: This is not true. Females can also suffer from hair loss like males. If your comb always shows some hair every time you are combing then it is a hair fall: This cannot be regarded as the thumb rule. Fact is around 100 hairs normally fall from the head of a healthy individual in a day. They are replaced by the newly growing hair. One cannot suffer from hair loss below 30 years of age: This is not true. An individual can suffer a hair loss at any age. The problem becomes more common as the age advances. Standing on your head daily stops the hair fall: Standing up side down is known to increase blood circulation to the scalp. But it is not proved to be beneficial for the patients of hair loss. Blow drying is not harmful: Fact is blow drying excessively or on daily basis can harm the hair follicles which can result in hair loss. Diet: Diet plays a very important role in the growth and maintenance of healthy and shining hair. Lots of pulses, green leafy vegetables and fresh fruits in diet can make a lot of difference to a patient suffering from hair fall. Under lying disease: Hormonal diseases like hypothyroidism can cause hair fall. Physiological body conditions: Some patients experience hair loss after pregnancy and during lactation. This can be due to hormonal disturbances and increased requirement of the body for a good nutrition. Stress: Stress plays a significant role in causing hair fall. But before blaming stress alone as a causative factor for hair fall, one must rule out other factors causing hair fall also. Handling the hair roughly can cause hair loss: Combing the hair with improper or hard hair brushes cause them to break easily. Such brushes also damage the hair follicles. Healthy hair follicles are responsible for new hair growth. Scalp conditions: If a patient is suffering from dandruff or other scalp diseases like fungal infection of scalp, or psoriasis of scalp then he suffers from hair fall and experiences hair loss. So, this is all about the myths and facts about the hair loss. Hope, this article helps readers to understand clearly the myths and facts related about the hair loss. This is a great along with very helpful piece of information and facts. Now i’m satisfied that you simply embraced this useful facts here. Make sure you keep us updated like that. Appreciate your discussing. A very good analysis of hair loss problem, Some basic reasons for hair loss identified. Hair loss problem can be resolved successfully.